We all agree that choosing the right keywords for your website and content is vital to increase our ranking on Google and other search engines. However, we also agree that keyword research and searching through endless keyword lists is a pain for most of us. But there is a solution for it! 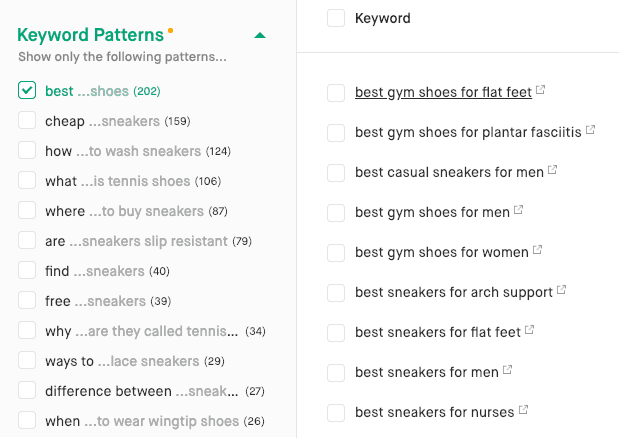 In this guide, we’ll show you how to get the best keywords for your website or content a lot faster with the AI-powered keyword tool Twinword Ideas. Within no time you will have just the keywords you need. Type in your product or service (not your brand name) into the search bar and click “Search” (or press the enter key). An example could be “sneakers”. Afterwards, you will get a long list of keyword suggestions. Step 2: What are the relevant topics? Now, using the Popular Topics filter on the left, select the topics that you are interested in. In our example we will select sneakers specifically for training and sports. After selecting popular topics, our list is now already significantly shorter. 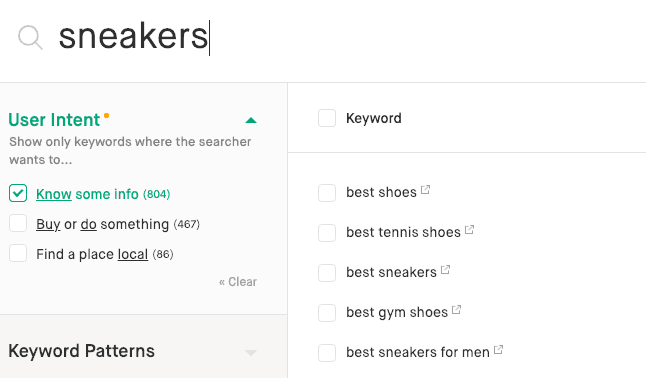 If after a brief look at the filtered keyword list and you don’t see the keywords you are looking for, you can always add your own custom topic. 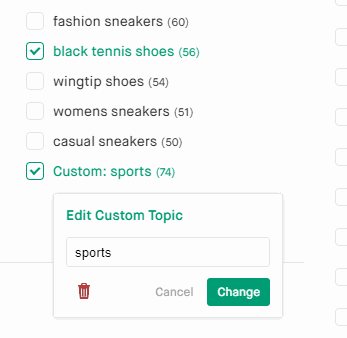 In this case we will add the custom topic “sports”. 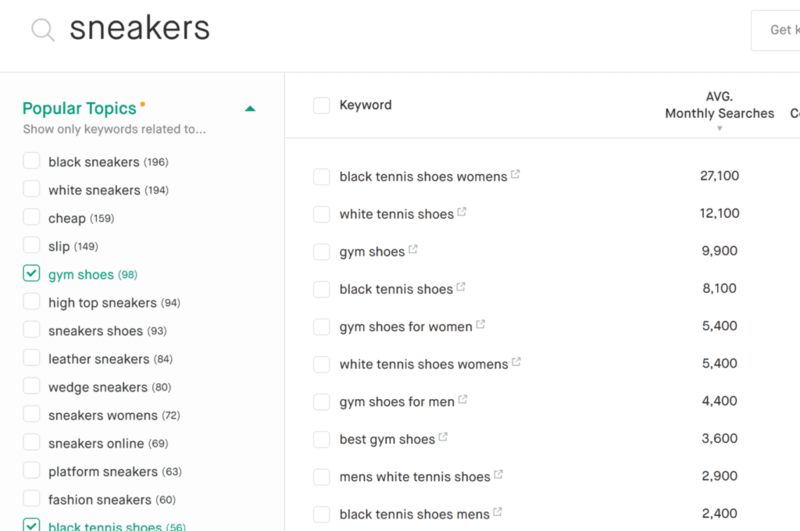 Now in our keyword list, we can see relevant keywords such as the keyword “running shoes”. Step 3: Why are you looking for keywords? If your answer is to get keywords for your web content such as a blog post or meta description, you can simply sort by our Keyword Score with the highest score at the top. The higher the Keyword Score, the better it is to try to include the keyword in your content. If you are looking for a keyword for your title, you can sort by Title Score with the highest score at the top. The higher the Title Score, the better it is as a candidate for a title or heading. This is because they are more long tail and can bring users that are more likely to convert or take an action you desire. If your answer is to get keyword for ads, you can sort by our Keyword Score. The Keyword Score is calculated based on the average monthly Search Volume and also the competition scores. The higher the score, the more worthwhile they are. The goal is to get low competition keywords where traffic is still high. Finish by selecting from the top keywords. Now, your keyword list should be decreased to only a few keywords and sorted with the highest scores on top. All that’s left to do now is to select the ones you want to use. Click the check boxes of the keywords you like or select them all. After selecting your keywords, click on the green button on the right to copy or download your keywords into different formats such as Excel or CSV. Quick tip: if you want to sort your selected keywords before you copy or download it, you can do so my clicking the green download icon on the right and clicking the “View selected” button. In this view, you can sort by search volume, keyword or title score, relevance, or SEO and paid competition. The above should be enough to get you started. However, in some cases when you want more exact filtering, you can utilize our more advanced features to filter your keyword list. For the examples below, you’ll want to first click on “Show advanced filters” button on the left side below the popular topics filter to show our entire list of filters. Now, let’s continue the Q&A by picking up where we left off. Step 4: Where do you sell? If you sell offline only, you can use the ‘local’ user intent filter to narrow down your keyword list. If you sell online only, or both offline and online, proceed to step 3. Step 5: Why are you looking for keywords? If you need keywords for your website, specifically webpage titles, meta description, tags and content (e.g. 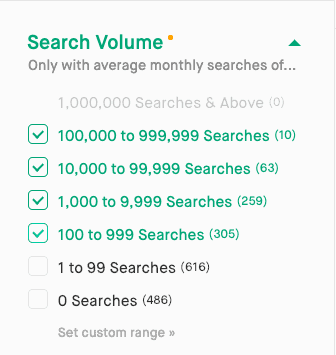 to optimize for SEO), use the search volume filter, or sort by average monthly searches to get keywords with high search volume. 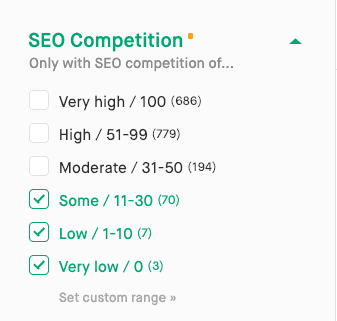 Then afterwards, use the SEO competition filter or sort by SEO competition to get keywords that have a low competition on Google’s search engine result page, and are therefore easier to rank for. If you need keywords for your content, you can use the popular topics filter to get inspiration for potential topics to write about. Simply click on any topic to get the right keywords for your topic, or even create your own topic to get keywords for any custom topic. Afterwards, you can sort by keyword and title score to get the best keywords for your content and titles. The more stars a keyword has, the better. 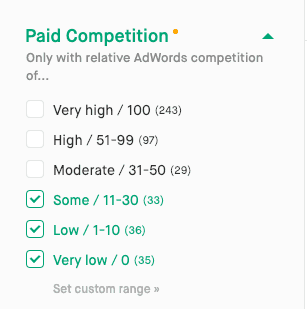 If you need keywords for Google Ads (former Adwords), Bing, or other paid campaigns (SEM/PPC), then use the paid competition filter to see cheaper keywords. Afterwards, use the relevance filter to increase the minimum relevance score to see more relevant keywords. Additionally, you can use the pattern filter or the include/exclude filter box to include keywords that have certain patterns, or to remove patterns you don’t need. Step 6: What kind of users do you want to attract? If you want to attract users that search for information and are therefore at the start of their buying journey, use the ‘know’ intent in the user intent filter. If you want to target users that are ready to buy and are simply comparing different options, use the ‘buy’ intent in the user intent filter. Step 7: Long-tail keywords only? Do you only want very specific keywords that have a higher conversion rate but therefore lower search volume? 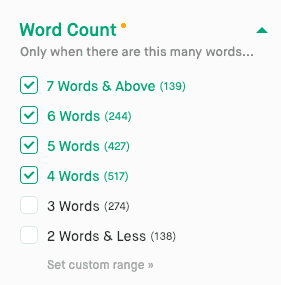 Then use the word-count filter to increase the word-count number to see long-tail keywords. Otherwise, move on to the next step. As seen in the getting started section above, you can sort your keywords and then go through the remaining keywords while selecting the ones you want. Now that your list is down to only 50 keywords, down from the original 1,739 keywords, this task is more manageable. Please keep in mind that the instructions above are only a guide. There are many ways to use this smart keyword tool to get just the keywords you need with only a few clicks. You can always mix and match the filters to see what gives you the best results for your product or service. 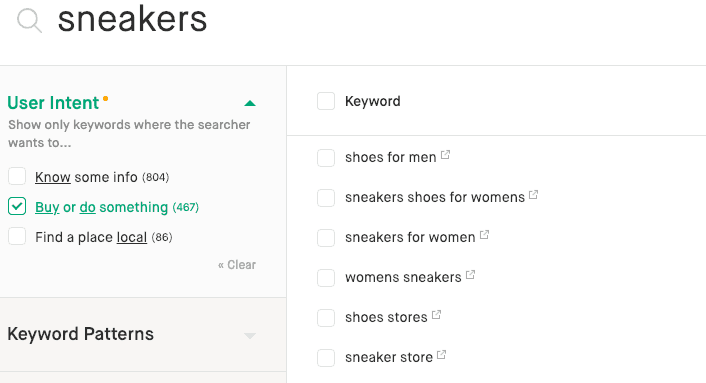 The goal is to filter your keyword list down to a manageable size, so you can then quickly go through a short list and easily select the keywords you want to use. Go ahead and try the keyword tool for yourself. Let the keyword filtering and content creation begin! 1Can I still use the old version of Twinword Ideas? Yes, please visit Twinword Ideas and click on the dinosaur icon at the bottom left. 2What are Average Monthly Searches? Average Monthly Searches, or Search Volume, indicates how many people on average have searched this keyword every month. 3What is SEO Competition and Paid Competition? SEO Competition is defined as the relative amount of web sites already targeting and competing for each keyword on search engine result pages with the maximum value of 100. Paid Competition is defined as the relative amount of AdWords competition for each keyword with the maximum value of 100. 4What are Keyword and Title Scores? 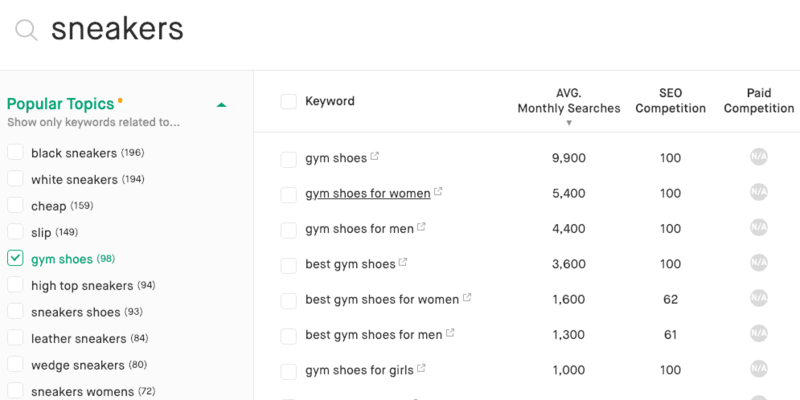 The keyword score indicate which keywords are best to include in your content, while the title score suggests which keywords are best for your titles. Both scores are calculated based on search popularity and relative competition to skyrocket your ranking potential. The relevance column reflects how semantically related each keyword is to your search query or target relevance. 6What is your pricing model? Twinword Ideas is subscription based. We offer three comprehensive plans: Plus, Pro, and Agency. Please see our Pricing for more details. 7Do you have a free plan? No, but you can still use all the smart features of our tool for FREE without signing up. Of course there will be some limits. If you reach your daily limit, please see our Pricing for upgrade options that better suit your needs. 8What happened to the free "Basic" plan? To maintain quality and to continue to provide accurate keyword data, we've had to make some changes. This included replacing the free "Basic" plan with a better "Plus" plan offered at a very affordable price. Existing "Basic" users were unaffected by this change and can keep their free plan. Furthermore, you can still use all the smart features of our tool for FREE without signing up. Of course there will be some limits. If you reach your daily limit, please see our Pricing for upgrade options that better suit your needs. 9How can I upgrade my account? If you upgrade your subscription in the middle of your billing cycle, the change will go into effect immediately and any difference in price between your current subscription and the new subscription will be prorated (based on the number of days remaining in your current billing cycle) and charged to your payment method. For the following billing cycles, your payment method will be billed at the new rate. 10How many keyword suggestions do I get for each search? The number of keyword suggestions depends on the plan you are on. Please see our Pricing for more details.